Unique thank you gifts they'll hang on to. Face it. We love to be thanked. And giving unique thank you gifts are the best way to help reinforce how we feel towards those who have such generous souls and give without question. If you've been given a toaster (cuz you really, really needed one) or you've been given encouragement (cuz you really, really needed it)...we feel the need to reciprocate. It feels good to want to give back. So we give thank you gifts. A thank you says "I really do appreciate you", or "I hold a world of gratitude in my heart because you do what you do or be who you be." Combine that with a gift and the whole idea is magnified 10-fold or 100-fold. Unique thank you gifts simply keep that warm fuzzy feeling going around and around, to not be forgotten. Haven't you ever had someone give you great service or put aside time for you or given you something you never expected? AND you were so thankful that you just had to do something about it? BY thanking, you are giving in return. That's why we love to be thanked because everyone feels a great sense of worthiness and comfort. 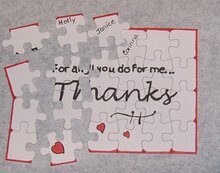 Here are a few thank you gift ideas that you can use for almost any occasion where you feel the need to thank someone. Give them a candle. For whatever it is you are thanking them for, one can actually hold a candle to them....but only because it is massage oil candle made from soy...it can be just a candle, just a fragrance candle, or you can use it romantically as massage oil...soy is incredible and healthy. Earthly Body 3-in-1 Candles at Amazon (see the link below) are pretty impressive. Use as a candle. Use for massage. Use for moisturizing. I repeat, soy massage oil candles are incredible. AND the fragrance choices will astound you. Give them a SHIRT. Not any kind of shirt, but a shirt in a color they like or a style they wear. Add embroider tastefully something along the lines of "The shirt off your back", and with a card expressing how you feel - "I know you'd give me the shirt off your back, so here's an extra one for the next time you give your all". Give them a ruler or tape measure. It's amazing the gender-geared tape measures that are available today....a 5-in-1 MULTI Function gizmo will really surprise them. With this your note can say "It's easy to measure the difference you've made. You're an amazing multi-functioner! Thank You." Give them a clock, watch, or timepiece. And your note can say something to the effect of "Thanks for your time", or "Your time is invaluable." Better yet...ever see an oregon scientific projection clock? These wonderful little gadgets you'll always be synched with the correct time even in the dark simply by casting your eyes up to the ceiling .... cuz that's where this clock shines best! Give them gold coins. They can be collector coins, they can be pretend play coins or give them a pound of foil covered chocolate coins. YUM! Your note can say "You are worth more than your weight in gold. Thank You." Your best bet is to try the one-pounder bag from Amazon - they are simply SO reliable with products, delivery and SERVICE. Looking for something truly different? CapturedWishes.com bottles up layers of symbolic glitter in magical pixie dust colors. Say thank you with a Sweet Gestures Appreciation gift. That's Right. Give them their own Personal Pixie Dust. You are so amazed with how simply awesome they truly are, whether they've given or shared something with you. So bottle up your heart-felt wishes just for them to return the good will back unto them. 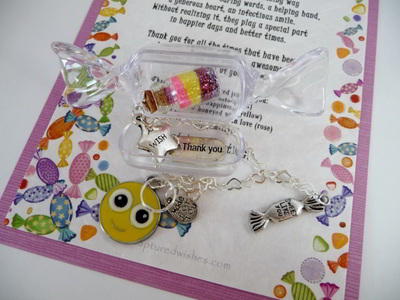 Wishes packaged up like this make for unique thank you gifts. 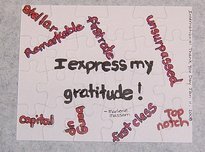 What better way to express your gratitude? Each layer color represents a wish! What will your wishes for them be? Give them NUTS. If this is you...give them a small bag or maybe a humongous can for them to find inside your note that says, "Thanks for being the best (friend, spouse, parent) ever. I'd go nuts without your support. Actually, what I'd do is have two bags or two layers...the second layer would have a note that says, "Wait a minute, I am nuts! But Thanks anyways!" Tip Your Hat to them. Buy a miniature hat as the gift and put a message of "Thank You, I tip my hat to you" on the visor. Simpler yet, make a paper hat with your message written all over it. January 11 is International THANK YOU Day and that seems to be a very appropriate time for thanking people. Christmas is over and the New Year's celebrations and resolutions are mere memories that we now reflect upon as the next 365 days start a new winding. So yes, we do need to reflect and recall the month of December where we spent so much bustling and rushing around to get ready for Christmas. Call it interactive thanking. The card is delivered in its envelope in pieces...intriguing enough to make the recipient wonder who it's from and what it says and what it's all about. I bought a box of blank puzzle cards and added my own words. And because I am who I am, the second picture shows the other side, or the flip side of the card. Very interactive! Thank you gifts or cards take on their own meaning. They hold their own in a distinct category. Appreciation and gratitude are powerful emotions. I still have thank you cards that I received through the years in my filing cabinet. I still have thank you pictures from students who used to ride my school bus back in the day. And small gifts. All these things remind me of my history of me, of events and doings I didn't consider as so important until someone pointed out to me with unique thank you gifts that they thought otherwise. And I really do think the warm fuzzy feeling needs to keep going around and around.